Eschew the tourist crowds and head to Nan Tien Temple and Sydney Observatory. Get a sense of the local culture at Bradman Museum & International Cricket Hall of Fame and Historical Aircraft Restoration Society. Get out of town with these interesting Sydney side-trips: Shelly Beach (in Manly), Wollongong Head Lighthouse (in Wollongong) and Megalong Creek Estate (in Megalong Valley). There's lots more to do: trek along Manly Scenic Walkway, don't miss a visit to Echo Point Lookout, steep yourself in history at St. Mary's Cathedral, and get some thrills on the water with a speed boat tour. To see other places to visit, traveler tips, more things to do, and tourist information, refer to the Sydney trip itinerary planning site . The Route module shows you all the different ways you can get to Sydney. January in Sydney sees daily highs of 32°C and lows of 23°C at night. Finish your sightseeing early on the 20th (Mon) so you can travel to Gold Coast. Eschew the tourist crowds and head to Coolangatta Beach and Queensland Museum & Sciencentre. Satisfy your inner culture vulture at Museum of Brisbane and Thomgallery. Get out of town with these interesting Gold Coast side-trips: Tweed Regional Gallery & Margaret Olley Art Centre (in Murwillumbah), Bunjurgen Estate Vineyard (in Bunjurgen) and Fingal Head Lighthouse (in Fingal Head). 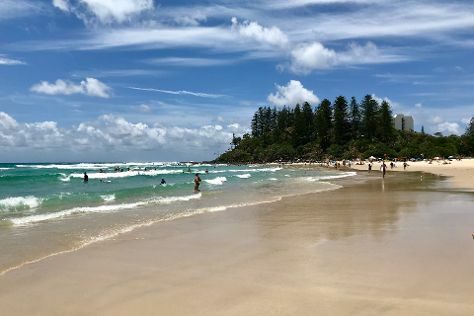 The adventure continues: kick back and relax at Kirra Beach, find your balance on the water with some of the best stand-up paddleboarding in the area, stroll through Belongil Beach, and contemplate in the serene atmosphere at New Govardhana Australia. For maps, reviews, where to stay, and tourist information, read our Gold Coast trip itinerary planner. You can fly from Sydney to Gold Coast in 3.5 hours. Alternatively, you can do a combination of flight and train; or drive. In January in Gold Coast, expect temperatures between 33°C during the day and 24°C at night. Wrap up your sightseeing on the 26th (Sun) early enough to travel to Melbourne. Satisfy your inner culture vulture at Art Gallery of Ballarat and National Vietnam Veterans Museum. Step off the beaten path and head to Eastern Beach Reserve and Phillip Island Grand Prix Circuit. Explore Melbourne's surroundings by going to Quealy Winemakers (in Balnarring), Redesdale Bridge (in Redesdale) and Lake Wendouree (in Ballarat). And it doesn't end there: take in the spiritual surroundings of St. Patrick's Cathedral, get engrossed in the history at Immigration Museum, wander the streets of Degraves Street, and explore the engaging exhibits at Australian Centre for the Moving Image. To find traveler tips, more things to do, ratings, and other tourist information, read Melbourne travel itinerary planner. Fly from Gold Coast to Melbourne in 4 hours. Alternatively, you can do a combination of train and flight; or drive. Traveling from Gold Coast in January, expect little chillier with lows of 17°C in Melbourne. Finish your sightseeing early on the 31st (Fri) so you can travel back home.